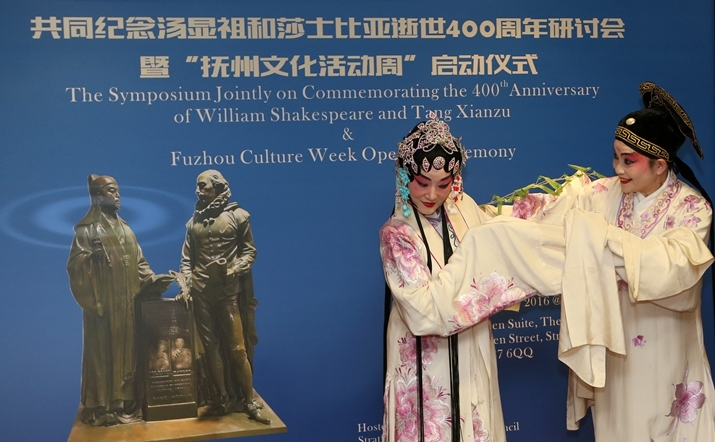 Exactly 400 years ago and thousands of miles apart, two renowned playwrights, Tang Xianzu (1550-1616) and William Shakespeare (1564-1616), from China and the United Kingdom respectively, both died. As this year marks the quadricentennial anniversary of their deaths, a series of events have been held in the countries that gave rise to their legacies to celebrate their accomplishments. Dolphin Books, a subsidiary of the China International Publishing Group (CIPG), has seized the opportunity to promote China-UK cultural exchanges. The company has published an English version of Tang's masterpiece, Dream in Peony Pavilion, and a Chinese translation of six of Shakespeare's tragedies—King Lear, Romeo and Juliet, Hamlet, Othello, Macbeth, and Antony and Cleopatra. The two sets of books were launched at the London Book Fair on April 12. They featured prominently at the pavilion of CIPG, a Chinese media conglomerate targeting international audiences. 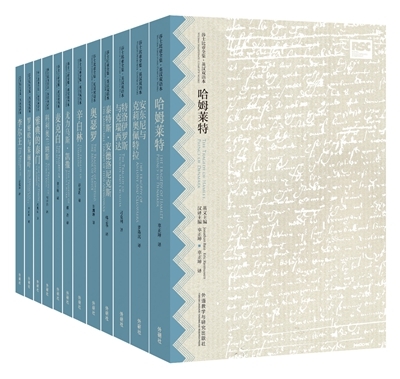 Xu Yuanchong, a retired Peking University professor, is the lead translator of these classics. Xu, 95, won the 2014 Aurora Borealis Prize for Outstanding Translation of Fiction Literature, a prestigious translation award granted by the International Federation of Translators. Tang's Dream in Peony Pavilion tells the love story between Du Liniang and Liu Mengmei, which Xu translated as "Du the Belle" and "Liu the Dreamer of Mume Flower" respectively, presenting the romantic idealism of the search for individual happiness. "Shakespeare was more realistic than Tang, while Tang was more romantic than Shakespeare. Shakespeare loved tragedy. In Tang's play, the heroine died, but she was revived after death because she loved the hero," Xu said. "This cannot be found in Shakespeare's tragedies. This shows the difference between Chinese and Western dramas." Additionally, the Beijing-based Foreign Language Teaching and Research Press (FLTRP) has published a Chinese translation of the complete works of Shakespeare to pay tribute to the Bard of Avon. "The whole set consists of 38 volumes of plays incorporating the genres of comedy, tragedy and historical drama and one volume of sonnets and other poems," said Yao Hong, a senior editor at FLTRP, responsible for the Shakespeare project. It is also worth noting that the original English version of the playwright's work was included in the Chinese translation of each volume. Shakespeare's works were first disseminated in China during the late 19th century by British missionaries. 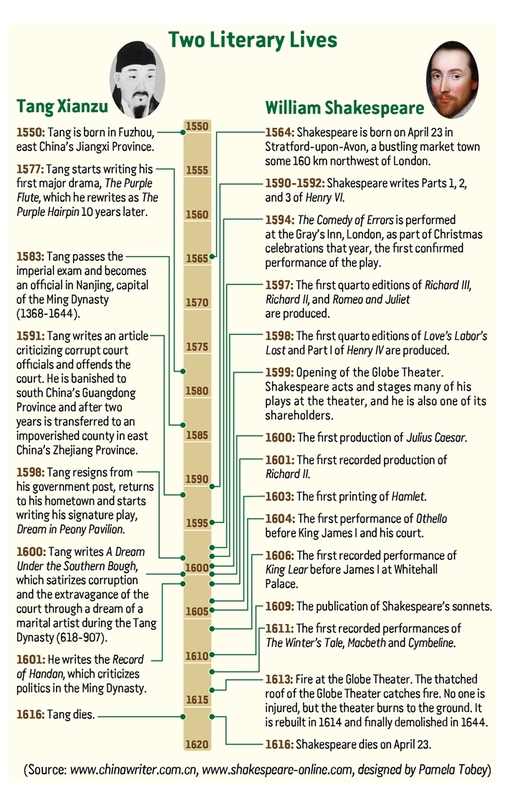 Shakespeare is currently one of the best-known foreign writers in China. Well-recognized Chinese translators of Shakespeare's works include Liang Shiqiu (1903-87), Zhu Shenghao (1912-44) and Fang Ping (1921-2008). However, compared with previous translators such as Fang and Zhu, who shouldered the complete works of the poet entirely on their own, the latest version is the result of the combined efforts of 23 translators and experts specializing in Shakespearean studies including Xu, whose translation of Othello appears in the newly published collection. "We spent a long period of time looking for suitable translators. First of all, the translators should have researched Shakespeare's plays. Second, they should be familiar with his poetic style," said Yao. Gu Zhengkun, a professor of comparative culture and translation with Peking University, was chosen as the project's chief editor. 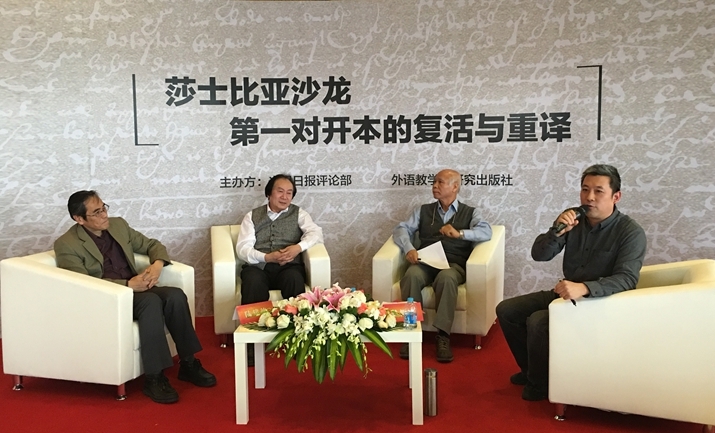 Renowned scholars such as Cao Minglun from Sichuan University, Luo Xuanmin from Tsinghua University and Zhang Chong from Fudan University were selected as translators. Gu, for his part, translated Hamlet, Macbeth, Romeo and Juliet, and The Merchant of Venice, as well as some sonnets. As Gu attempted to replicate the poetic style of Shakespeare's plays, though, he told Beijing Review about some of the difficulties inherent in translation. "Just as the Chinese erhu instrument cannot make the sound of a piano, it's impossible to reproduce completely the beauty of the English language through a Chinese translation. What I want to achieve is beauty unique to the Chinese language," said Gu. The translation was based on The RSC Shakespeare: The Complete Works published by Macmillan Publishers in 2007. It is the first and only edition to be developed by and for the Royal Shakespeare Company (RSC), the world's leading Shakespeare theater company. "It's based on the First Folio and is regarded as the closest to the originals," said Yao. First Folio refers to a collection of 36 of Shakespeare's works published in 1623, which is the major source for contemporary texts of his plays. As the translation was done by a group of professionals, their interpretation and styles may vary from one to another. Nevertheless, according to Gu, the end products dovetail with the diverse themes and styles of Shakespeare's works. Even the RSC has played a part in opening up cultural exchanges through its tour of China, which lasted from March to April 2016. Gregory Doran, RSC Artistic Director, said in a press release, "I profoundly believe that we foster deeper understanding between cultures by sharing and telling each other our stories." Doran added, "China's rich dramatic heritage mirrors the epic scale, complexity and universality of Shakespeare's work, and the country has a national curriculum which requires young people to study his plays." Yao agreed, commenting on the Bard's success in China: "Films such as Hamlet and Romeo and Juliet, introduced to China two to three decades ago, have partly contributed to his popularity. Even if one hasn't read his works, he or she must have heard of his name. If intellectuals don't read any of his works, they must feel something is lacking." Gu started to read Shakespeare's works when he was a teenager. The play he first read was A Midsummer Night's Dream. At that time, he felt Shakespeare's works were too romantic, since he was more interested in realistic writers such as Russian writer Leo Tolstoy (1828-1910). It was not until he read Othello and some sonnets that he fell for Shakespeare. He chose Hamlet as the subject for his PhD thesis at Peking University. "Shakespeare's works encompass everything, from kings to ordinary people, from the court to folk society, from international to domestic affairs, and from the afterlife to the secular world. There is no second writer who can command such a variety of topics," said Gu. Xu, who has translated six tragedies of Shakespeare, dreams of translating the rest of the playwright's works into Chinese in his lifetime. He also appreciates Shakespeare's linguistic skills and praises his concrete and elaborate language. One example of the playwright's use of language that Xu cited was the creation of new words such as "unpeople" to render his description more accurate. In Antony and Cleopatra, Cleopatra says she would "unpeople Egypt" by turning all of its citizens into messengers in order to send love letters to Antony. "Shakespeare's appeal is worldwide; the themes he dealt with in his work, such as loss, love and jealousy, are truly universal," said Nick Marchand, Director of Arts and Creative Industry at the British Council in China. Scholars have drawn parallels between Shakespeare and his Chinese contemporary Tang, a Ming Dynasty (1368-1644) playwright. That is despite the fact that Shakespeare is more prolific than Tang—the former wrote more than 30 plays while the latter wrote only four. 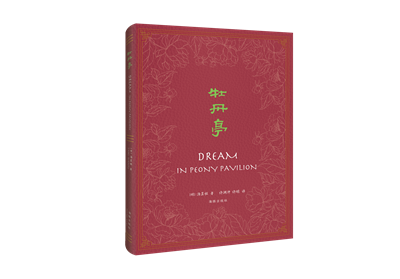 According to Gu, Dream in Peony Pavilion possesses beautiful lyrics which can be sung while Shakespeare's plays cannot be performed in similar fashion. Gu said that the play "alternates between poetic lines and colloquial language, offering readers a respite, while most lines of Shakespeare's plays are written in the form of iambic pentameter, which can sometimes be tiring." Nevertheless, he claimed that Shakespeare excelled in other factors. "The plots of his plays are complicated, attractive and sometimes unexpected. There are plays within a play, ghost stories, feigning madness, and murder by mistake," Gu told Beijing Review. According to Marchand, the British Council, an organization specializing in international cultural and educational relations, has organized a "Shakespeare Lives" program to celebrate the anniversary through events such as "The Dreamer"—a collaboration between the Shanghai Dramatic Arts Center and the UK theater company Gecko—which links Tang's Dream in Peony Pavilion to Shakespeare's A Midsummer Night's Dream. 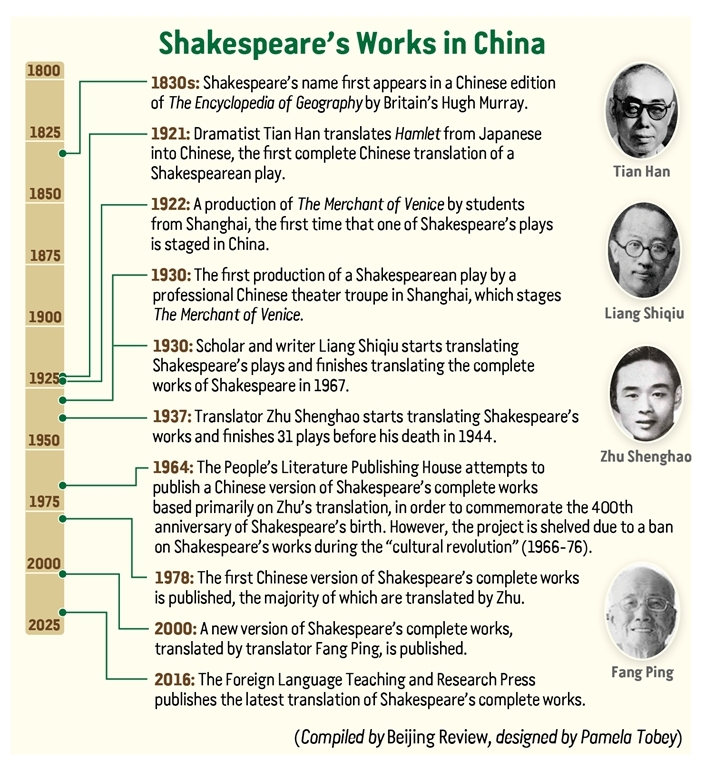 In addition to being translated into Chinese, Shakespeare's works have also become an important subject for academic research in China. "However, compared with Western countries, China still has a big gap to fill in terms of Shakespearean research. It's like foreigners studying the works of ancient Chinese poets Li Bai (701-762) and Du Fu (712-770). There are bound to be obstacles," said Gu. Gu suggested that Shakespearean researchers in China should adopt Chinese perspectives in order to break new ground.